You’ve probably been taught from a very early age about how important it is to brush your teeth every day, not to mention flossing and going to the dentist. Oral hygiene is important, even though it’s easy to overlook sometimes. This is true not only for you, but also for your dog. We’re going to take a look at the best methods and cleaning products for your dog’s teeth to keep them happy and healthy! Every tooth is important making sure that the dog’s food is properly processed before it travels down the esophagus and begins its journey through the digestive system. In humans, tooth problems cause other issues too, from gum disease to serious and life-threatening infections. This is also true for dogs. Their teeth need to stay clean, and sometimes, they need a little extra help from their owners. Let’s take a look at the best dog toothbrushes. Just like your own teeth, the most vital aspect of canine dental health is through a toothbrush. When it comes to picking out a toothbrush for your dog there’s a lot of gimmicky solutions out there. The truth is anything that’s a “toy” will likely quickly be destroyed from chewing and won’t brush all of your dog’s teeth. Similarly many soft, bristle-less toothbrushes aren’t strong enough to actually help remove plaque and tartar from your dog’s teeth. For these reasons we prefer the below toothbrushes for dogs. The design of toothbrush is in line with dog's oral structure, which is more comfortable and safer. The design of the handle is made of rubber, which can better grasp the toothbrush, and it is not easy to slide and fall off. 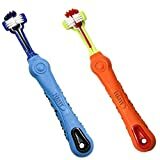 This three-sided toothbrush from Pertty helps you brush all surfaces of your dog’s teeth at once which means faster cleanings. The bristles and heads of the toothbrush move along with your dog’s teeth to make sure every nook can get cleaned out. 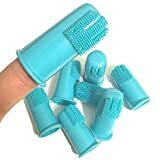 I also really like these for brushing my dog’s teeth because the handle is a nice heavy rubber that’s easy to grasp and feel sturdy. These toothbrushes are a nice, cost-effective way to brush your dog’s teeth. At 8.5 inches long, it’s easy to hold on to these and get into the back of your dog’s mouth without your hand getting in the way. Also nice is one side has a larger set of bristles than the other, so you can choose between covering a lot of area at once or working into those smaller crannies. Another brushing solution are these silicone finger toothbrushes. You can simply put this on your finger and use the soft bristles to work away on your dog’s teeth! This may be ideal for pets that are scared of a foreign object coming near their mouth but aren’t afraid of your hand or fingers. Obviously if your dog is aggressive or a biter this isn’t the brushing option you should use. Another nice aspect of this style of brush is you can really feel your dog’s teeth through it as you brush as well as any tartar build up, so it gives you a feel for how hard you need to press to clean your dog’s teeth. Do I Need to Clean My Dog’s Teeth? Brushing a dog’s teeth is probably the last thing on your mind. But unfortunately, a lot of dogs have some kind of undiagnosed oral pathology. 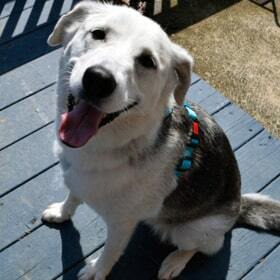 Some experts estimate as many as 80% of dogs have some kind of dental or periodontal problem. Dogs suffer from a lot of the same oral health problems as humans, like gingivitis and tooth decay. They have bacteria in their mouth that form biofilms of tartar and plaque, just as we do. Bad oral hygiene is bad news for your dog. Gum disease, in particular, is a big risk factor for other, more serious afflictions. The offending bacteria can emit secretions that can damage the tissues in other organs throughout the body, including the brain and kidneys. This gets more and more likely as your dog gets older. Fortunately, you can prevent gum disease by making sure you’re taking proper care of your dog’s teeth. I recently came across an extremely interesting oral care solution from Oxyfresh. They make a water additive that works for both cats and dogs that helps promote oral health in your pets – all you have to do is mix in their product with your dog’s drinking water, and it does the work! Oxyfresh will freshen your pet’s breath, fight plaque and tartar, and break down biofilm which can prevent harmful bacteria from breeding in your dog’s mouth. What’s really important though is that this product has been clinically proven safe and effective for your pets, so you can use it with confidence. 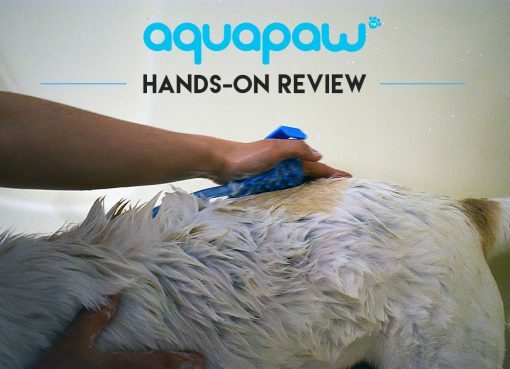 Check out our full Oxyfresh dog water additive review to get a deeper dive. 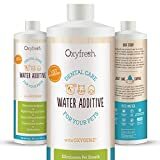 While you will still want to physically brush your dogs teeth, Oxyfresh is an awesome solution if your dog puts up a fight when it comes to getting around their mouth. If you’re concerned about your dog’s oral health, I see Oxyfresh as a very simple and pain-free way to promote oral health in your dog in a non-invasive way that they won’t mind or notice. Of course, simply using a toothbrush doesn’t quite get the job done. Adding toothpaste into the mix helps to truly clean your dogs teeth and fight plaque build-up. This special doggie toothpaste is specially designed for the bacteria that lives in a pet’s mouth and also even fights bad breath! Worried about your dog letting toothpaste anywhere near their mouth? Luckily, many dog toothpastes are also made in flavors that dog love too. The above example is poultry flavored – disgusting for humans, but dogs love it! It will be like giving your dog a treat every time you have to brush their teeth so they’ll actually look forward to it. Some dogs react negatively to a toothbrush being stuck in their mouth, in which case you might need a different option. 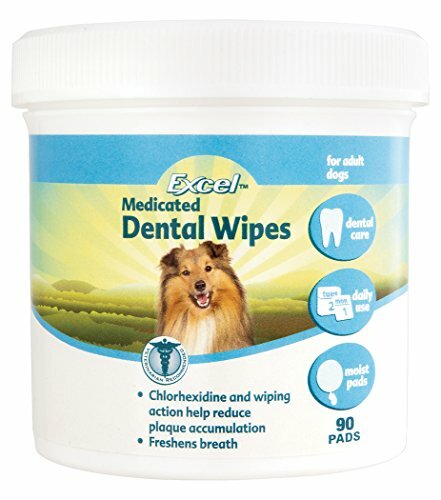 For these dogs, you should look into these Dog Dental Wipes. Dental wipes are just what they sound like – a small cloth carrying some cleaning solution that you wipe over your dogs teeth and gums to get them clean. For whatever reason, dogs may react much better to what they interpret as your finger being poked around their mouth rather than a foreign object. 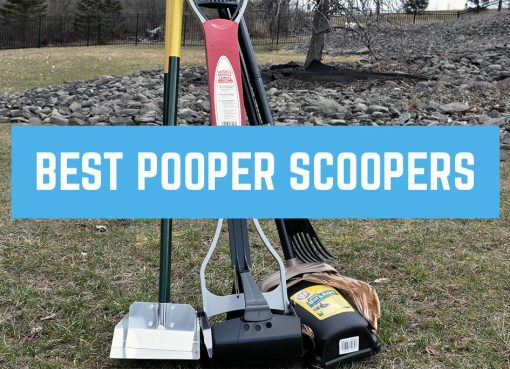 Dogs tend to love the flavor of these wipes as well, which helps. 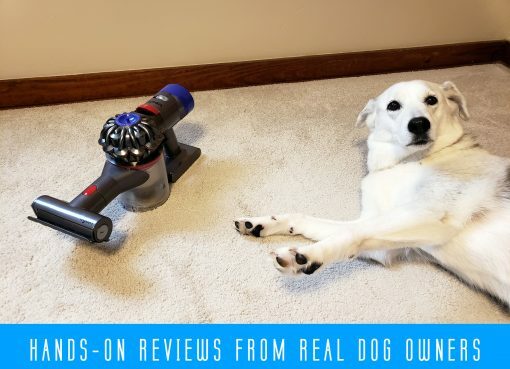 Of course, the holy grail of all dog cleaning products – the treats! 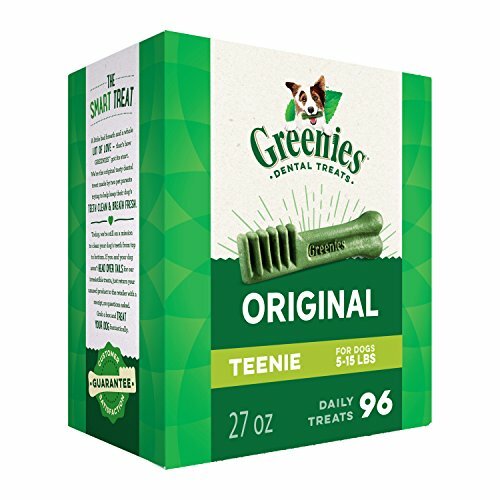 Treats like Greenies have a taste dogs love, and there’s no work in it for you! Greenies have a special texture and ingredient list that helps clean your dogs teeth as they eat them. It’s hard to ensure your dog will get all of their teeth clean with treats like Greenies alone, so we recommend you use them to supplement other cleaning methods, not replace. So how do you actually go about brushing a dog’s teeth? Here’s a quick step-by-step run through of the general process. Before you start, spend some time handling his teeth first. If your dog is already an adult and he’s not used to having his teeth brushed, he’ll probably be confused about what you’re trying to do. It’s a good idea to get him used to having your hands in and near his mouth first. One way you can do this is letting him lick peanut butter off your fingertips. As you get him used to this, start acquainting him with having his mouth opened and his teeth examined. This is a preliminary step, and it can take some time before you’re able to actually start brushing his teeth every day. Let your dog sniff the toothpaste and the toothbrush. Before his first brushing, let your dog sniff your supplies. Most dog toothpastes are meat flavored, so he’ll probably be pretty interested in it. Move his lips aside to brush the front teeth. The first few times, this might be about as far as you get. Over time, increase the number of teeth you brush. After a while, your dog should get comfortable giving you access to all of his teeth. Brush them gently in a circular motion, just as you’d do with your own teeth. Don’t forget to brush the gums gently, too. End the tooth brushing session with a reward. Whether’s it’s a special dental dog treat, a trip to the dog park, or something else your dog loves, make sure he associates having his teeth cleaned with a positive experience. And that’s all there really is to it. As we said, getting your dog comfortable with this can be an ongoing process. Don’t expect to brush all of their teeth the first time out. But in the long run, making a habit of brushing your dog’s teeth regularly is one of the best things you can do for their oral health. 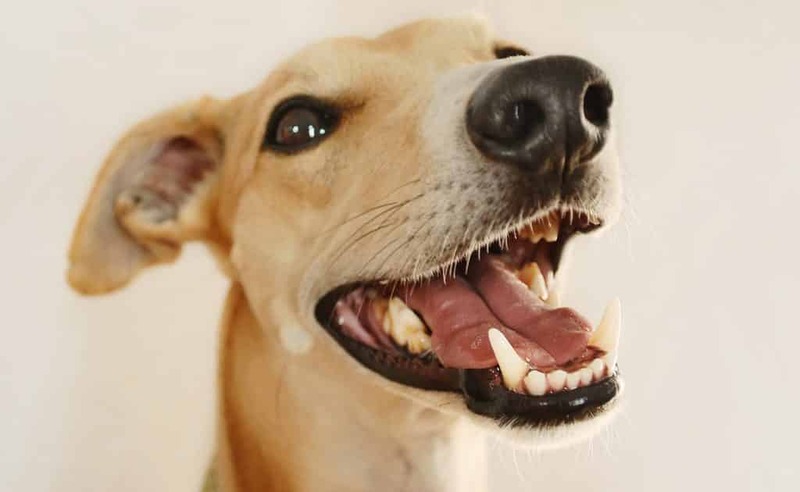 Just like us, dogs have both temporary “deciduous teeth,” and permanent teeth that are there to last for their entire life. The first set comes in around three to six weeks. The second set come in when they’re three months old, six at most. If you have a very young puppy, this is something you need to keep in mind. The process works about the same as it does in humans. And like young humans, teething can be uncomfortable, so you may want to have some chewable toys on hand to help soothe their aching gums. The permanent teeth should come in by the time your dog is six months of age. Normally, this is a pretty straightforward and natural process. You should be aware that just like in humans, complications can occur from time to time. Some of the potential problems that can arise as your dog’s deciduous or permanent teeth come in can include the following. Delayed eruption of deciduous teeth. Your dog’s “baby teeth” should come in by six weeks. If not, you may want to take them to your vet. 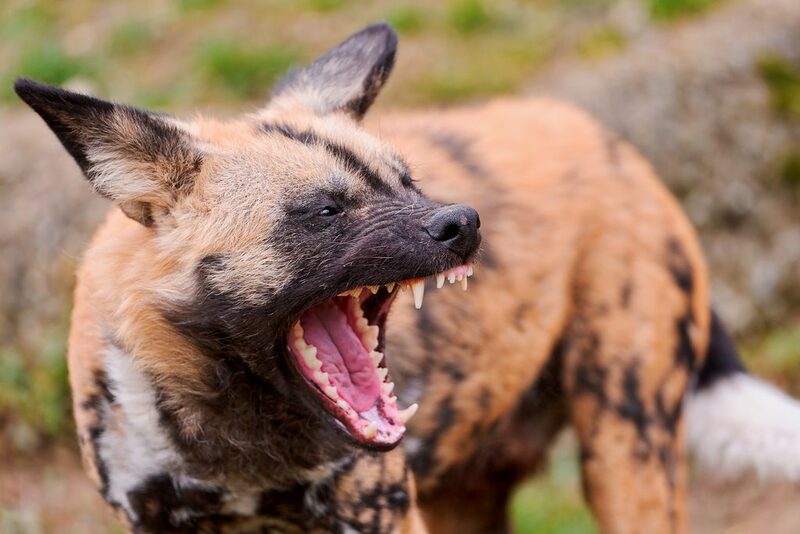 In some dogs, there’s an unusual dense type of gum tissue over the teeth, making it hard for them to erupt normally. There’s a simple surgical procedure to fix this, but it’s best to have it done before the age of nine weeks. Missing permanent teeth. Like in humans, the permanent teeth are initially underneath the deciduous teeth. Sometimes, one of them just isn’t there. The baby tooth doesn’t come out if there’s no permanent tooth underneath it, and it can stay functional for years. However, it may still eventually need to be extracted. Fractured baby teeth. When your puppy chews on things it really shouldn’t be chewing, its baby teeth can actually fracture. This exposes the pulp inside the tooth, which is prone to infections. This requires tooth extraction. These aren’t all that common, and in most dogs, both sets of teeth come in just fine. But, they are possibilities to be considered. It’s okay if you’ve never brushed your dog’s teeth before. A lot of people don’t even think about that kind of thing, but it’s never too late to start. By making a habit of keeping your dog’s teeth clean and healthy, you can improve their long term health and make sure they have strong teeth throughout their entire lifetime.